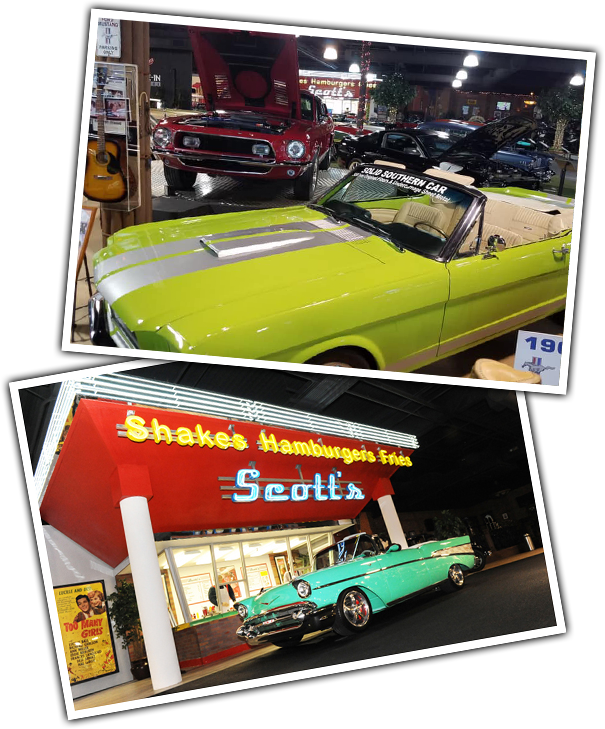 Tom and Diane Day’s love for Classic Cars began at Scott’s Diner, from a 1957 black and white Ford Fairlane in which they met in 1960. 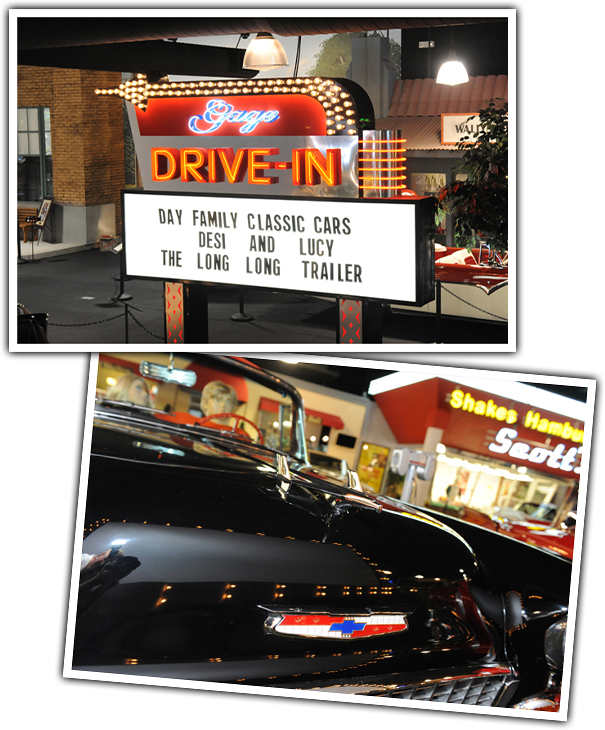 Close to sixty years later, the Day’s passion for cars, family, and movie & sports memorabilia is stronger than ever. 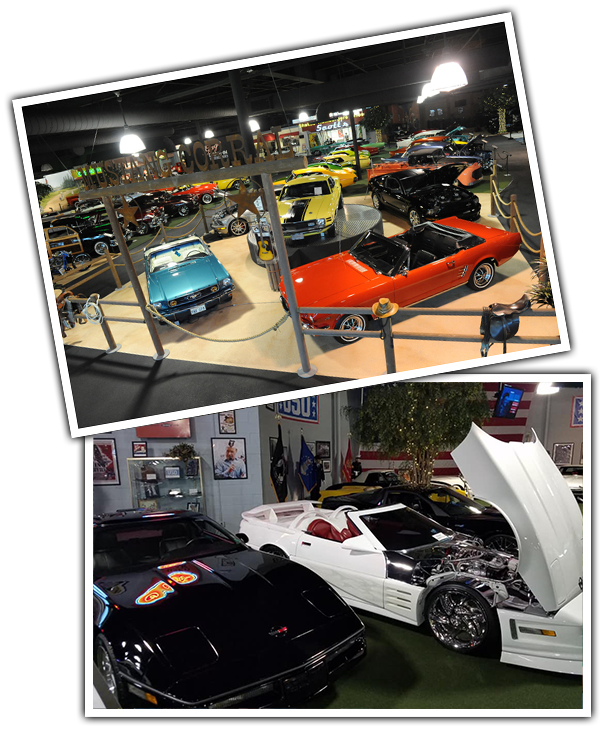 The One-of-a-Kind Collection offers everything from Muhammad Ali’s boxing gloves to an autographed Kareem Abdul-Jabbar basketball, both of which can be found in the 1920’s speakeasy; adjacent to the drive-in theatre and the Mustang Corral for Ford Mustangs. You won’t believe the collection of Corvettes in the Vet’s Vetts corner, proudly honoring our service men and women. There is even an actual set used during a taping of “The Voice” upstairs. The collection transports you to places iconic to American History. You can revisit Mayberry from The Andy Griffith Show, seeing props from Floyd’s Barber Shop and the gas pumps at Wally’s Service Station. Diane, an avid collector of Lucille Ball memorabilia, has original items from Lucy’s dressing room and the Silver Spur Rolls Royce she drove to the studio. “I was born to live in the 40’s and 50’s,” Diane Day said. “I just love old cars.” She is the real collector behind the over 140 cars displayed and collected over the last 10 plus years. How did the collecting start? The family went to Hot August Nights in Reno in 2005 for the first time. Tom’s friend had a bidder’s pass, so he got one too! Tom bought a 1957 Ford Fairlane, reminiscent of the one Diane’s dad used to have. At that same auction, he bought his grandchildren each a car. Candice got a Corvette and Kenny a Camaro, starting a tradition. From then on, once each grandchild turned 16, the legal driving age, he bought them a car as long as they were able to pay for the insurance and gas on their own. Today, the collection can be enjoyed by approved charities, organizations for fundraisers, and car clubs in which to hold events. Want to Experience Our Americana? Our collection is only available for private tours and non-profit fundraisers. Since hosting our first fundraiser in 2011, we strive to offer our support for numerous causes and worthy organizations.